Several of those involved in the 1974 Communist Party/Maori delegation to China were active in the following year's, Maori Land March. 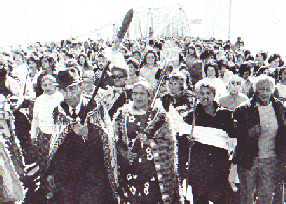 In 1975, a new Maori organisation "Te Matakite o Aoteroa" (TMA) organised a huge land march to demand the restoration of "Maori Lands". The march started in the far north and traveled the North Island, ending at Parliament Buildings in Wellington. The marchers wanted Maori control and management of remaining Maori land. "I attended meetings of the movement which subsequently adopted the name Matakite (the Seers). Basically I went along as an observer so as to be well informed on the movement... But... I could not adopt the role of passive observer. As a person with skills that are much needed in the Maori world, I was impelled by circumstances to write the Matakite Manifesto as the legitimate quid pro quo for my presence at meetings." Other key activists involved included the group's first vice presidents, Tom Poata and Eva Rickard, as well as Dun Mihaka, Ripeka Evans, Titewhai Harawira, Syd and Hana Jackson, Barnie Pikari and Bay of Plenty, Communist Party leaders, Bernie Hornfeck and Willie Wilson. The organisation was in many ways an extension of Nga Tamatoa, but this was kept in the background. "The idea for the Land March came from Nga Tamatoa, from Titewhai, Syd and me. We realised that we could only unite Maoridom by having someone with mana lead it. Whina lived just around the corner. So we asked her. Nga Tamatoa decided to play a low key role because the media had given us such a bad image." Nga Tamatoa members active in the march included Ted Nia, Rawiri Ruru, Ripeka Evans and Syd and Hana Jackson. The march became one of the big news items of 1975. Thousands participated, many of whom were, surprisingly enough, Marxist-Leninists. 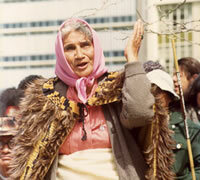 Whina Cooper complained to the media about "communists" trying to take over her Land March. Known Communist Party members, or sympathisers participating in the march included Willie Wilson, Bernie Hornfeck, Tihema Galvin, Hone Tuwhare and Jimmy O'Dea. A few months after the Land March, TMA secretary Tom Poata and Nga Tamatoa activists Rawiri Ruru and Tame Iti, tried to set up a Maori Tent Embassy outside Parliament. They wrote to Chairman Mao, British newspapers and world leaders to intervene in behalf of Maori land rights. As usual, Poata warned of "real violence, bullets and bloodshed over land issues". Whina Cooper wisely disassociated herself from these revolutionaries. Dame Whina Cooper showed great wisdon and perception is seeing through the wannabe revolutionaries. Trev, how about an article on some well known (and not so well known) anti-communists. Such people I'm sure will have lessons to teach us feedom loving people today. It just really makes me angry of how Communist parties like the Communist Party USA can just go and suggest how the Patriot Act is going to take away people's freedoms and civil liberties, but then have its own members travel to a totalitarian nation like China or Vietnam which have no freedoms whatsoever. It's also the same "reasoning" with folks like Omar Ahmad leader in the Council on American-Islamic Relations who is although against the Patriot Act, but wants the Koran to be the "highest document in the land" replacing the U.S. Constitution. Oh Mah, you're always angry ! See the Doc perhaps, a spot of Valium, even Prozac maybe.......? I'm told your tin soldiers are getting a little peeved about the way you thrash them around your lounge room. Let up Man !